Home » About Book Blogging » Books: Catching up with myself! Books: Catching up with myself! I’ve been busy blogging about Boof’s list and my list and meanwhile books are being finished! That’s a good thing. I’m definitely going to make my Goodreads goal (and surpass it!) of 55 books by year end. Good times. Love Goodreads. “A Lover’s Dictionary” by David Levithan – My Goodreads review: A quick, satisfying read. David Levithan tells a love story through word definitions (and you know I love the dictionary!). Sometimes silly words, often powerful words. It tells a story fully in short, packed definitions. Good stuff. “Attachments” by Rainbow Rowell – My Goodreads review: What a fun and unique book! Told through emails that get caught in a filter and the IT guy who reads them. It was amazing how much you learn about people from reading their emails and all characters were very likeable. I was cheering for them to be happy and really unsure how it was going to turn out until the very end. How satisfying! * I already posted this info but it’s worth posting twice! It is going to be a favorite of 2011 I think! “The Particular Sadness of Lemon Cake” by Aimee Bender (audiobook) – My Goodreads review: I tried to read this once and it didn’t grab me. It remained on my TBR list so I got it on audio from the library, and I’m sorry to say it didn’t grab me again! It got better as it went on, but I wouldn’t have finished listening to it if I hadn’t had some miles to put on the car this week. The author read the book and it sounded like it would sound if I read the book – nothing special. Just being read to. That said, there were a few moments I will remember for a while – the story (parable) that Rose tells about her classmate that couldn’t read and then found out that he couldn’t see was quite powerful. I’m currently reading (and loving!) 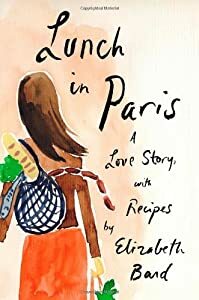 “Lunch in Paris – a Love Story with Recipes” by Elizabeth Bard. How fun! I think it’s going to have to go on my wishlist to own and go on my cookbook shelf right next to “A Homemade Life”! They are similar in that there are recipes relating to each chapter but Bard’s book is filled with yummy sounding French recipes. Ooh la la! And on the books into movies front, I purchased the new “Jane Eyre” movie and I am patiently waiting for friend Cindy to find time to watch it with me! In the meantime I found a 1983 British miniseries of Jane Eyre on instant Netflix so I’m refreshing my memory on the story – in 11 episodes it is probably not too abridged! A few Italian movies I reserved during Ferragosto have come to me from the library so I have another to watch tonight. There are a few in the theatres I’d like to go see but we’ll see how it goes! This entry was posted in About Book Blogging, General Book Talk and tagged Aimee Bender, Book, books, catching up, David Levithan, GoodReads, Jane Eyre, Netflix, Shopping. Bookmark the permalink.